ICV Townhall Webcasting was called on to produce the first in a series of Corporate Townhall style webcast events for GOPro. 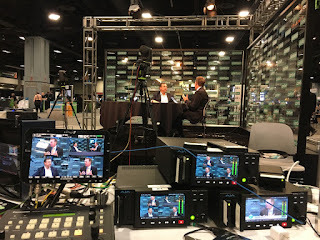 GOPro contacted ICV's webcasting specialists to learn more about how we could improve upon their existing, less than ideal webcasting strategy. After some planning and consultation, ICV put together a plan for regular Townhall webcasts at the GoPro corporate offices. With this new webcasting program ICV manages and deploys all of the Audio Visual production, all of the Live Webcast event logistics as well as the Live webcasting production. The video streaming is managed within a secure Media Portal which is our custom webcasting platform developed in house here at ICV. The ICV Media Portal will allow GoPro to repurpose their archived webcast video content and use it as an ongoing resource for training and reference. Learn more about improving on your Webcasting Program. ICV can develop a simple plan to manage all of your webcast and video initiatives.